ATTENTION MUSIC ARTISTS WANT TO PERFORM IN ATLANTA, GA FOR FREE!!! 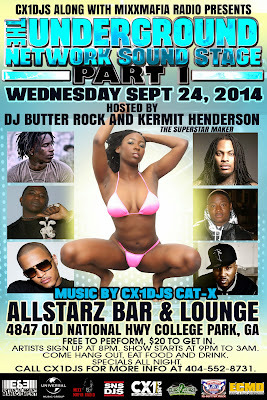 This event will be held at AllStarz Bar & Lounge 4847 Old National Hwy College Park, Ga on Wednesday September 24, 2014. Free to Perform $20 Admission. Artists sign up at 8pm Show start at 9pm-3am. Come hang out, Food & drink specials All night. Call Cx1Djs for more info at 404-552-8731.